Improves aging skin in only one treatment! 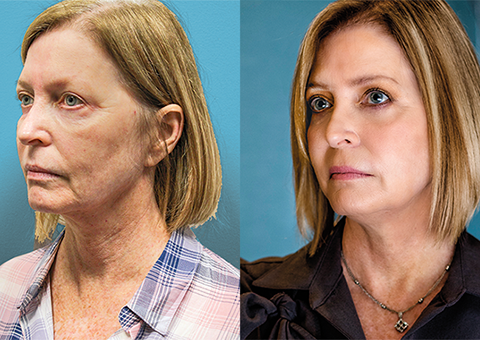 You can reverse the signs of aging and achieve your best look with the safe, effective and convenient Pearl Fractional laser treatment from Cutera, available at Runnels Center. With this procedure, you can have sun-damaged skin improved with only one treatment. More specifically, you can treat brown spots and sun damage, as well as skin tone and texture. Your skin will become noticeably smoother and brighter. The Pearl Fractional Laser is safe, effective and unique. During the procedure, only a fraction of the skin is exposed to the laser beam. Tiny holes in the skin and columns of damaged tissue are selectively removed while the surrounding skin remains intact. When the skin heals, it creates new collagen and plumps the skin from below, resulting in a reversal of photo-aging and other imperfections. Clients generally see results after one week, with maximum results visible in two to three months. Cutera's Pearl Fractional is a Volumizing Laser that uses proprietary technology to offer both immediate and long-term anti-aging benefits. Patients notice immediate improvement in their complexion, greatly reducing the signs of aging. Long-term, patients will see continued structural changes in their skin, including increased volume and firmness. The Pearl Fractional Laser aggressively treats the signs of photoaging by stimulating new collagen growth. How does the Pearl Fractional treatment work? Fractional therapy describes a treatment that exposes only a fraction of the skin to the laser beam in a pattern of tiny dots. During the procedure, laser pulses place tiny holes in the skin. The process removes columns of damaged tissue and then stimulates the body’s own natural process for creating healthy, new skin, full of fresh collagen. This plumps the skin from below, creating more volume and repairing photodamage and other imperfections. So call today and schedule your appointment! Runnels Center, Outpatient Plastic Surgery, Clinic & SKIN the Spa, of Jackson Mississippi offers the latest in plastic surgery techniques by Dr. Scott Runnels, board certified surgeon. Surgical procedures include body contouring, liposuction, tummy tucks, breast augmentation and reconstruction with Natrelle breast implants, facial enhancements, and cosmetic fillers such as Botox, Juvéderm, Vollure XC, and Kybella. SKIN the Spa offers custom facials, chemical peels, HydraFacial MD, SkinPen Precision microneedling, Cutera laser treatments, and eyebrow microblading performed by our licensed aestheticians. The Spa also features a wide array of Medical Grade Anti-Aging Skincare products. *NOTE: Individual results may vary. Patient testimonials are provided as examples of some patients results and experience, however, all patients are unique and these examples are not meant to present or to imply that any one patient’s results can be expected by another patient.